Hey everyone, fun little topic for all those who like to show off shiny things like me. Most of you already knew that if you are a low-mid master player, you can go grind a couple of games on WoL to get GM easily to unlock the GM achievement, the GM career icon in profile and career page, and a front profile page 1vs1 GM icon (with liberty written next to it). You can also chill in chat rooms with your GM border if you leave the game on WoL while chatting. 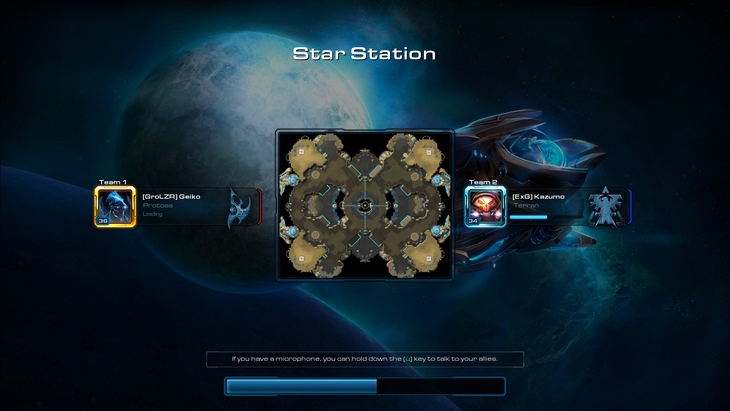 "As a EU GM Protoss, I say that ...."
Some of you already knew that you could get the GM border on the loading screen as well for HotS team games if you are in a team with a partner and he launches the game while you are still in WoL. But did you know that you could also get it in 1vs1 and have everyone treat you with the respect you deserve ??? Follow these easy steps for a life-time of HotS GM bliss. Start a 1vs1 game in HotS. As soon as the game timer starts, click ok to switch. Hit the "Play Again" button ! Enjoy your new Border ! Take screen shots and go brag on the interwebz. Don't forget to thank Geiko for this awesome trick. Lol Geiko you are a funny guy. hahahaha but playing so many games in wol... is it even worth it? Mussolini ModProtoss all-ins are like a wok. You can throw whatever you want in there and it will turn out alright.